Can you see the biz jets? When you are standing on the ground it is pretty easy to see an airplane in front of you. That RJ stands right out, but what is not so obvious watching that video is the perspective from the front seat of a large widebody aircraft. There are some advantages when sitting in the cockpit of a large widebody aircraft. 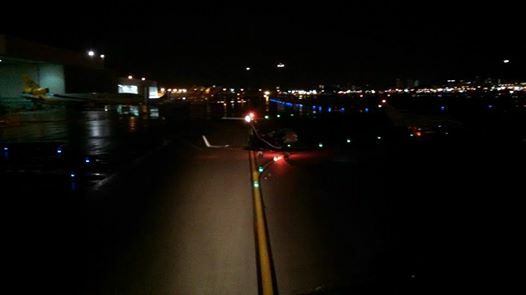 The taxiways are a lot easier to discern, and it is not so easy to get lost in the “sea of blue lights” that comprise the taxiways of a major airport at night. Down low those lights tend to blend together, but from a large widebody, the perspective is much better. We can look down and see the taxiways from somewhat of a “birds eye view”. Not like really flying, mind you, but a heck of a lot better than being “down in the weeds” as a pilot is in a smaller aircraft. However, with that height also comes a disadvantage. 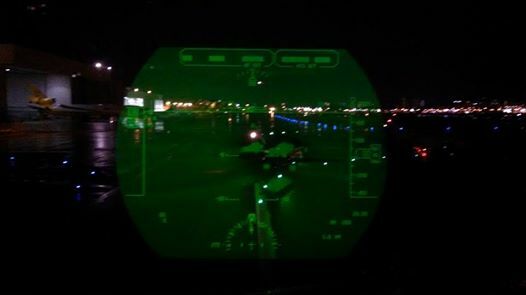 Smaller aircraft literally blend in with the ground lights. 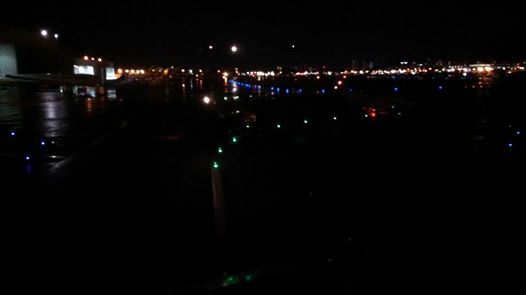 The salience of the aircraft lights, when compared to the taxiway and other associated ground lights, is just not that great. On a recent flight, I had a great opportunity to take some photographs of a Lear 60 and a Hawker 800, both fairly good sized corporate jets, as they waited in front of us for departure. Take a look. The first shot is with with our taxi light off, and just the lighting existing. Can you make them out? While not so obvious from a still shot, there are two glowing areas of coming off the Lear’s engine exhaust. Those are actually moving around like a flame, which really increases their salience. It is much easier to see that there is something in front of us. For those that do fly smaller aircraft, this might all be food for thought. Do not assume that the big widebody headed your way can see you. The situation that Air France encountered is quite common. It is very unlikely that the Air France crew had much chance of seeing that RJ buried in all the surrounding lighting.